Feb 13, 2019 Version 2.0.0 becomes Alt-Ergo-Free 2.0.0. Feb 11, 2019 A small recap of what we have done in 2018. Feb 11, 2019 Release of version 2.3.0. See the main CHANGES. April 21, 2018 New release (version 2.2.0) with an experimental support for (a polymorphic extension of) SMT-LIB 2. Mar 14, 2018 New release (v. 2.1.0) with the CDCL solver as a default SAT engine. Nov 14, 2017 New release (v. 2.0.0) with support for floating-point arithmetic. Nov 21, 2016 New release (v. 1.30) with experimental support for models generation. Feb 16, 2016 New public release: private version 1.00 becomes public release 1.01. 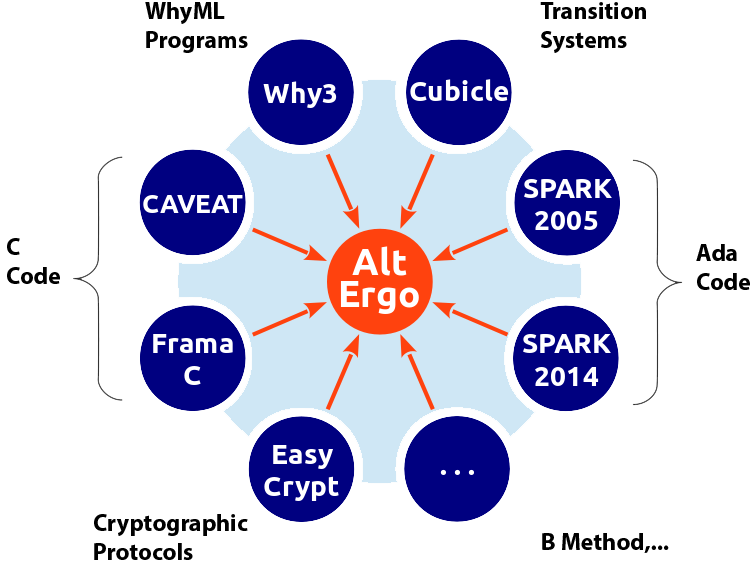 Jan 29, 2015 A new major private release (version 1.00) of Alt-Ergo is released. Jul 15, 2014 Here is a small tutorial about "try Alt-Ergo". Feb 10, 2014 Discover our development/release process scheme ! Feb 07, 2014 The latest public release is now available on a Github repository. The latest release of Alt-Ergo is version 2.3.0. It was released in February 11, 2019. It is available under the terms of the OCamlPro Non Commercial license version 1. Please, follow the links below to download Alt-Ergo, to report a bug, or to ask a question. You may also want to read the CHANGES or see some examples written in Alt-Ergo's native input format. Alt-Ergo-Free version 2.0.0 is released in February 13, 2019. It is based on Alt-Ergo version 2.0.0, and is available under the terms of the Apache Software License version 2.0. You can see the list of CHANGES here. providing a quality industrial support for developers and industrial users in order to get the best performances from the solver. Our clients will have access to the sources of the latest private releases. They will also benefit from our services such as extended developer/production support, dev-on-demand, and re-licensing. Feel free to contact us for more details. You have a problem related to formal methods ? You don't know if Alt-Ergo is suitable for your situation ? We can help you to determine the better technology to use for your need. You are involved in a promising R&D project and you are looking for partners in the field of formal methods ? Our experienced R&D engineers will be happy to contribute to the success of your project. Feel free to contact us to see how we can collaborate. Alt-Ergo is an open-source automatic solver of mathematical formulas designed for program verification. It is based on Satisfiability Modulo Theories (SMT). Solvers of this family have made impressive advances and became very popular during the last decade. They are now used is various domains such as hardware design, software verification and formal testing. What is Alt-Ergo Good for ? Alt-Ergo is very successful for proving formulas generated in the context of deductive program verification. It was originally designed and tuned to be used by the Why platform. Currently, it is used as a back-end of different tools and in various settings, in particular via the Why3 platform. For instance, the Frama-C suite relies on it to prove formulas generated from C code, and the SPARK toolset uses it to check formulas produced from Ada programs. In addition, Alt-Ergo is used to prove formulas issued from B modelizations and from cryptographic protocols verification. The figure given below shows the main tools that rely on Alt-Ergo to prove the formulas they generate. You are using Alt-Ergo in another context/tool not cited above ? Let us know ! fixed-size bit-vectors with concatenation and extraction operators. Alt-Ergo results from academic researches conducted conjointly at Laboratoire de Recherche en Informatique, Inria Saclay Ile-de-France and CNRS since 2006. Publications and theoretical foundations are available on its academic web page. Since September 2013, Alt-Ergo is maintained and distributed by the OCamlPro company. Academic researches are now conducted in collaboration with the VALS team of LRI. © 2013 — 2016 OCamlPro SAS, All rights reserved.